A group of local business people are getting together to host a mental health workshop to raise awareness, relieve workplace stress and discover the therapeutic benefits of song. The next meeting of Mid Yorkshire Network, Huddersfield – run by Ramsdens Solicitors, The Mid Yorkshire Chamber of Commerce, Better Telecoms, Social Progress And The Media Centre - will be held on Wednesday 16th May, 9am to 11 am at The Media Centre’s, Café Ollo and will invite its attendees to join a singing workshop, led by Huddersfield based charity, Hoot Creative Arts. Mental Health Awareness week is being held 14 – 20 May and is this year focusing on stress. Research has shown that two thirds of us experience mental health problems in our lifetimes and a key factor of this is stress. Hoot Creative Arts based in Huddersfield believe that we all have a creative and imaginative capacity that is of central importance to our mental and physical health, wellbeing and happiness and it is their aim to release this capacity. 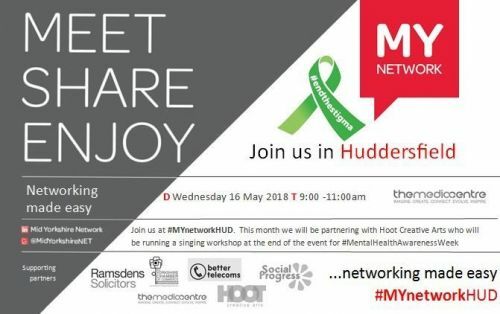 Brent Wood, Chief Executive at The Media Centre commented: “Mental Health Awareness Week provides us with an excellent opportunity to raise awareness amongst Huddersfield’s business community of how workplace stress can too often lead to mental health problems. Our friends at Hoot Creative Arts work at at the front line using creative expression to improve mental and physical health. We hope that Hoot's MY network singing workshop will hit the right note with local businesses and help them better understand and cope with stress." Mark Evans, Owner, Better Telecoms added: "MY Network allows local businesses and creative minds to join together, find out more about each other and help each other to make useful connections and do business together. Our motto of MEET, SHARE, ENJOY sums it up. Usually there is no fixed format, just friendly open networking, but at our next event Jess from Hoot will be leading a singing workshop that we would love to encourage everyone to stay and take part in." To find out more about the networking group, or for more information about the upcoming event join the Mid Yorkshire Network Linked In group, or follow us on Twitter @MidYorkshireNET.